Screens 4 has landed on macOS. Screens, arguably the finest and most attractive VNC client for Mac and iOS, is now even greater. 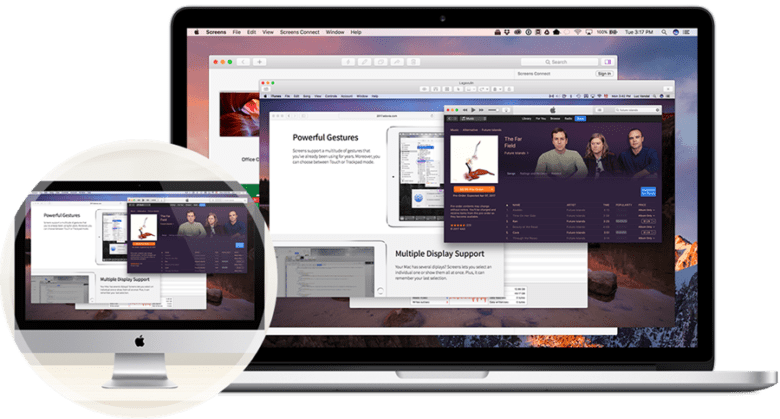 Its version 4 update for macOS brings a more polished user interface, the ability to transfer files between your devices, Touch Bar support for the new MacBook Pro, and more. Not only is Screens beautiful on Mac and iOS, but it’s one of the simplest VNC clients. Setup is simple, and remotely controlling your computer from an iOS device is a breeze. With Screens 4, new features and improvements make the whole experience even better. Screens now sports a new look that’s cleaner and improves usability. You can finally transfer files between Macs, while the new Curtain Mode blocks the remote display of the Mac you’re connected to so that prying eyes can’t see what you’re up to. If you purchased Screens 3 after January 31, 2017, you’ll be entitled to a free upgrade to Screens 4. If your copy of Screens is older than that, you might be eligible for a 40 percent discount; check the upgrade page on Edovia’s website for more information. If you’re new to Screens, the latest version is $29.99, with a 14-day free trial available.